Quilting, Sewing, Painting, Oh My! I found a fairly solid shelf sitting in a thrift store. The thing was ugly. Someone had tried (and failed) to paint it black. You see, you cannot simply paint furniture a new color. You have to strip it. Paint doesn’t stick to finish – I wish it did. 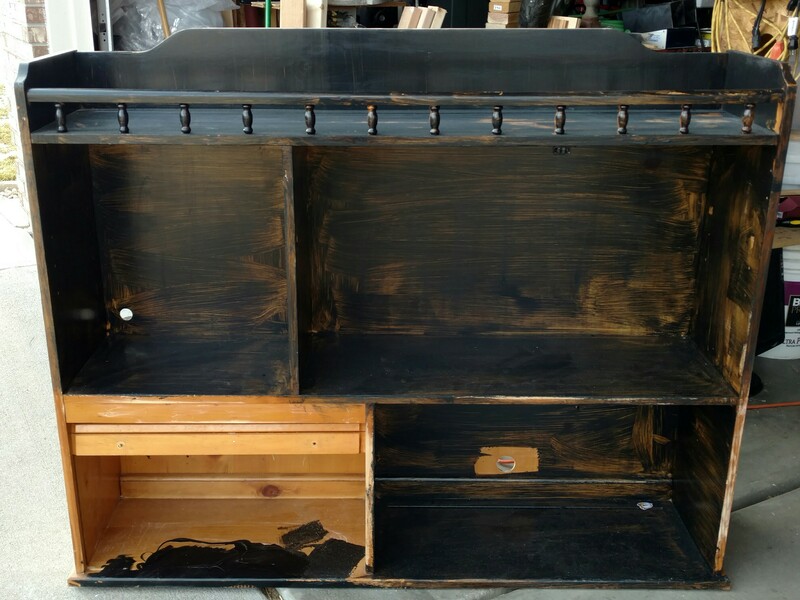 This poor shelf had paint streaks all over it. 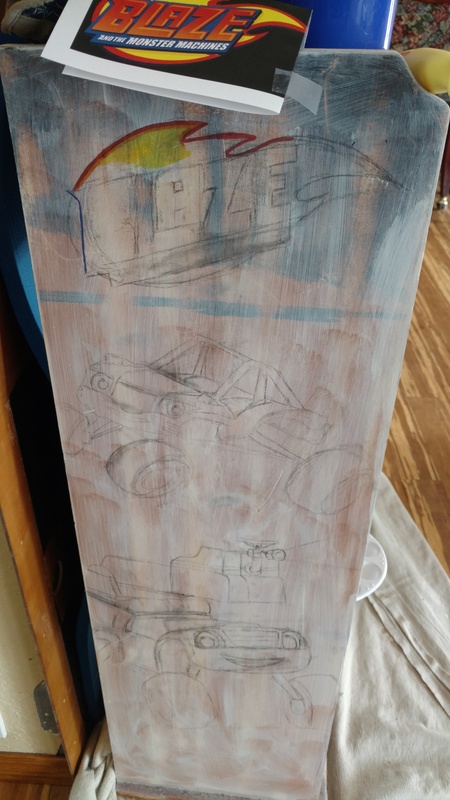 First step is to always strip or sand it down to create a surface to which paint will stick. If you’re going for a natural wood finish then it needs to be done, then you have to get into all the little grooves, etc. (Always wear the appropriate safety gear: safety glasses and a mask!) I’ll wipe the surface down remove any spider webs, etc. Then I get out my husband’s hand sander and use large grit sand paper for the first pass, gradually working my way to finer grit paper with each pass. 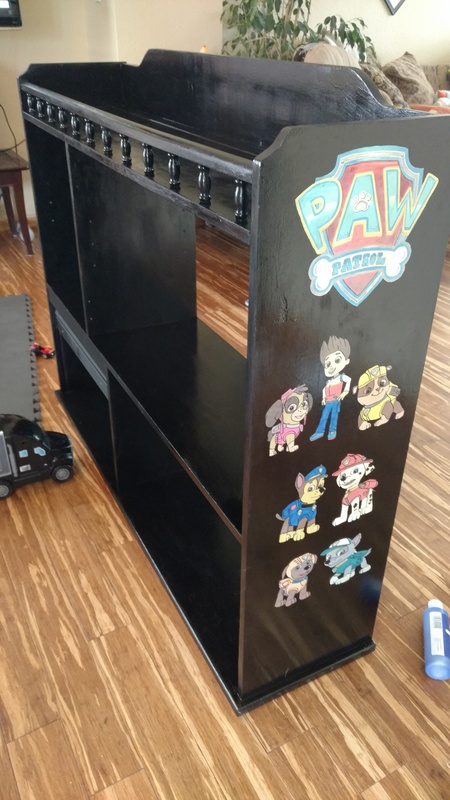 Once stripped I use some gesso as the first coat and outline the characters that I want to paint on the shelf — in this case my son’s favorite cartoon characters: Blaze and Paw Patrols. For the Blaze side I used some paint markers that claimed to be for all surfaces. I really didn’t like them. The tips would shred really easily making it difficult to get good detail work done. I had to make a trip to Michael’s where I found some sturdier tip markers that I used on the Paw Patrol side. I painted the cartoon characters first to avoid multiple coats since my plan was a black shelf. Once the main shelf was complete, I painted the shelf back blue. Finally, both parts of the shelf got a polyurethane finish. 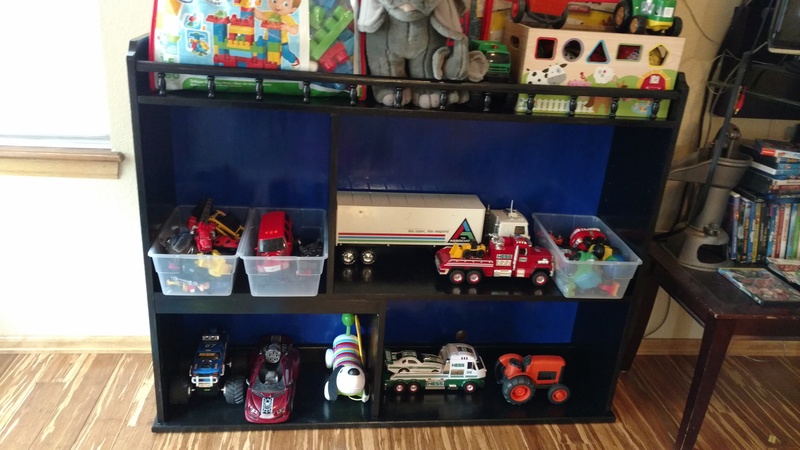 When everything dried, I screwed the back onto the front and my son had a new shelf. 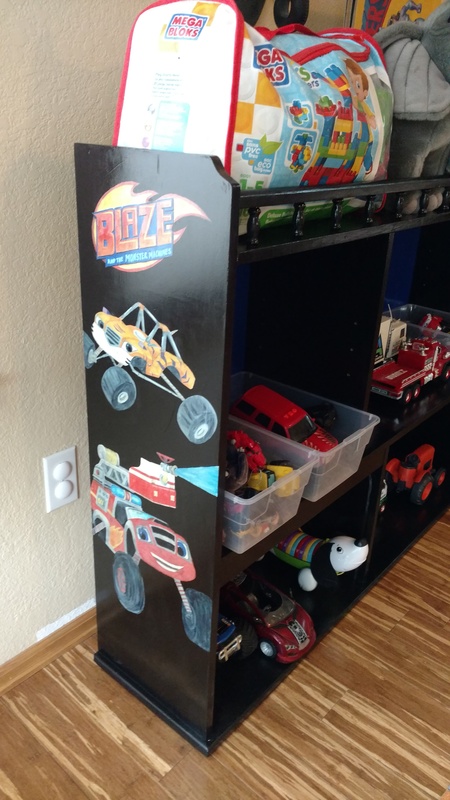 I did let my son paint a portion of the shelf – he had a blast! This was definitely a fun project.